The Washington family coat-of-arms is surmounted by a "flying griffin", a mythological creature that featured as the family crest for generations. George Washington placed the crest, a winged lion's body with a bird's head, on many of his possessions, including his bookplate, silver plate, and presidential coach. In 1757 Washington acquired a mahogany version of his coat of arms, which he placed in the front parlor, "the best room in my house." 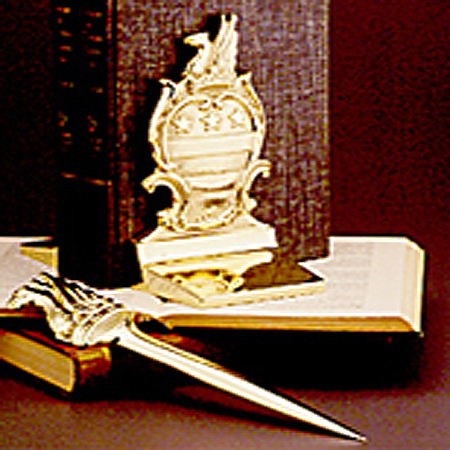 This 8" all pewter letter opener features the griffin at the top of the 5 -1/2" blade. Made in America by Salisbury Pewter.